Is standing among the ruins of Machu Picchu, gazing upon the farming terraces, and walking on sacred ground on your bucket list? 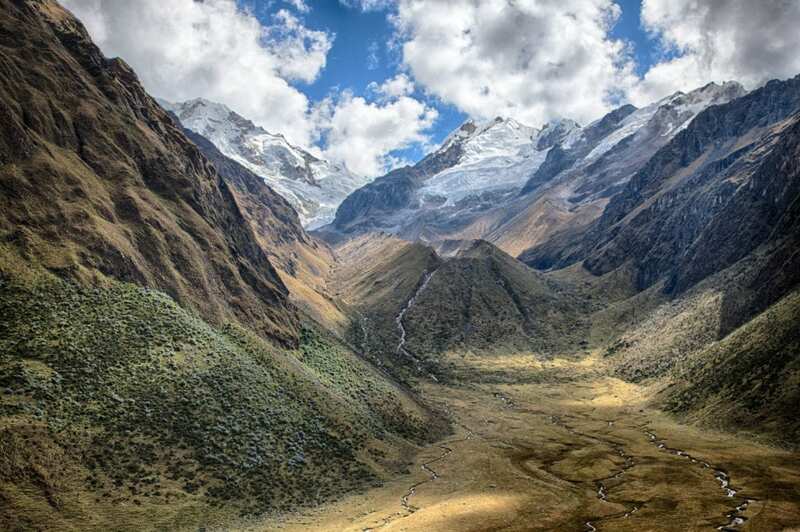 How about hiking through the Peruvian wilderness in order to arrive at this majestic site? If you answered yes to both of these questions the Choquequirao Trail is worth investigating. 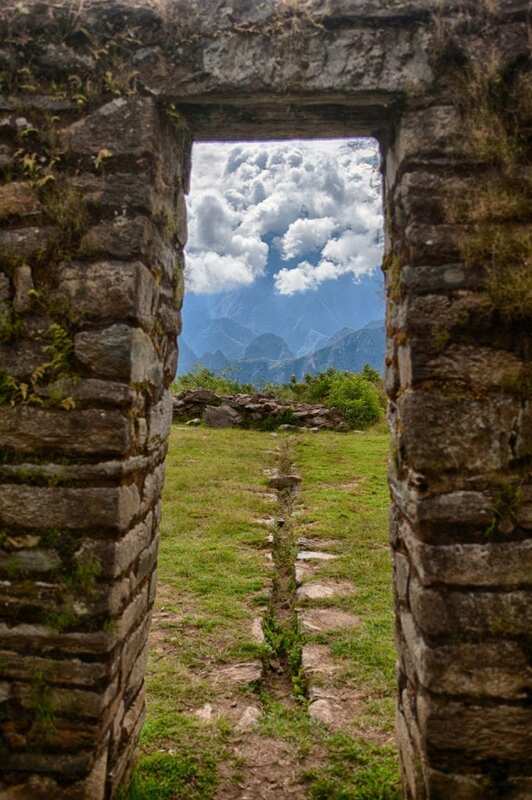 Although the Inca Trail is the most famous hike to Machu Picchu, the Choquequirao Trail offers ruins to explore, mountain passes to cross, remote villages to stay in, picturesque views, and fewer people. At 75km long, 5000m of elevation gain, and 5000m of elevation loss the Choquequirao Trail is considered strenuous, but more than worth it. 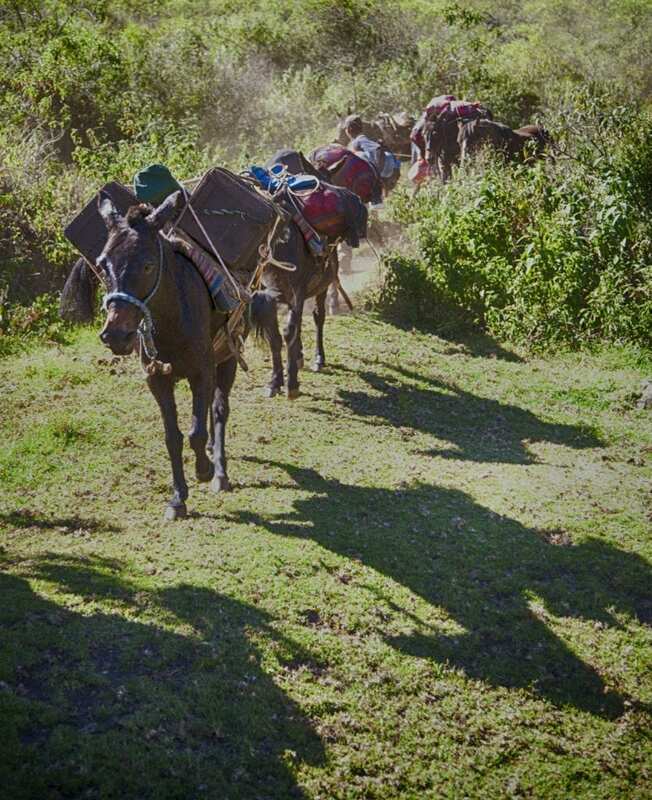 Hikers on the trail vary from backpackers carrying all of their own gear to guided tours with fully loaded mule teams. If a less expensive trip is what you are looking for carry your gear and buy food and water in the small villages along the way. If a more pampered trip (tents set up by the time you get to camp, meals prepared, mules carry the bulk of the load, and an “emergency horse” to help when needed) sounds better, work with an outfitter to set up your trip. Day 1 – Drive from Cusco to the trailhead at Cachora. Hike to Chiquisca and camp. The hike on Day 1 is all downhill. In 10km you will drop from 2,950m to 1,550m to Chiquisca. After a couple hours of down, the camp is a welcome site that offers cold showers and tasty drinks. An early wake up is encouraged before starting this 12km day. The day starts with a loss of 65m to the Apurimac River bridge crossing. On the other side the steady hike up starts. 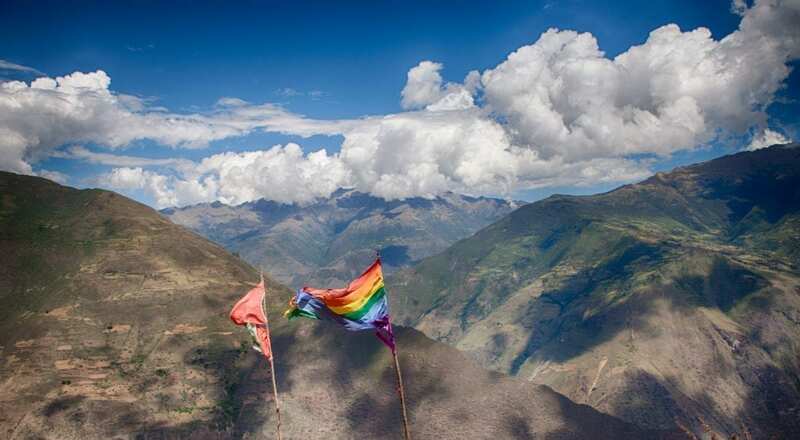 After a gain of 1,415m and passing through Santa Rosa you will be relieved to see the village of Marampata. Either stay overnight at Marampata or continue to the campground just short of the Choququirao ruins. The short hike up to Choquequirao will wake up your legs, and lungs, and get you ready to explore the ruins. The complex covers 1,800 hectares and is 30-40% excavated. Follow the canal up the hillside to see how water was diverted from a nearby river to the city. Explore ruins of temples, houses, and burial buildings. Climb up to the top of the flat hilltop surrounded by rocks and enjoy the views of the surrounding valleys. Lounge in the main plaza and relax in the sun. **Don’t miss the llama terraces behind the main plaza. ** Go to the bottom of the steps and follow the trail to the viewpoint in order to see the llama terraces in their full glory. Can you see the white rock llamas going up the terraces? Can you see the shepherd at the bottom? On your way back to camp, explore the lower part of Choquequirao. The trail to the lower portion can be a bit tricky to find, but it starts in the campground below the ruins. At 19km with 1,380m of elevation gain and 1,400m of elevation loss Day 4 is a tough one. Take the trail that climbs above Choquequirao – this is a great last vantage point of the ruins. Snap a couple last pictures of Choquequirao before starting the 1,400m trek down into the Rio Blanco canyon. Enjoy a cool dip in the river before starting the 1,200m climb up to the small campsite at Maizal. With no light pollution, Maizal is a great place for star gazing. Once you find the southern cross, make sure to look for the llama in the black space next to it. If you are lucky, you may just watch a shooting star cross the sky. Today’s hike starts with a climb up to the Abra San Juan pass (4,000m). If the clouds allow take in breathtaking views or the Cordillera Vilacabamba mountain range. The trail then does a rolling traverse past the silver mines of Mina Victoria. For the brave, take a couple of steps into the mine (bring a headlamp or flashlight). Traverse a bit farther before the trail starts ascending again. At the next pass you will reach a covered picnic bench, perfect for a lunch break. Have a little energy left and feeling adventurous? Climb one of the small peaks nearby and see how the view changes. After lunch the trail starts descending and you will head down into the town of Yanama. Depending on the time of year, you may pass through lupin fields where the flowers grow taller than a person. Day 6 features a hike up to Yanama Pass (4600m – the high point of the trail). Follow the road out of town before picking up the trail. 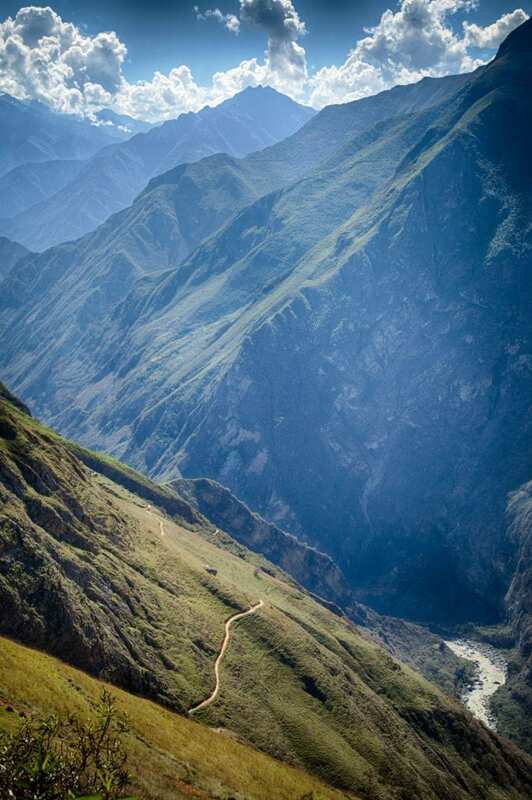 Glacial mountain views accompany you for this hike. As you gain elevation, steps get smaller and breathing gets a little harder. If you are on a guided tour, the “emergency horse” is a great option if the trail (and elevation) get to be a bit too much. Make sure to have a warm coat with you as it can get cold at the top. After descending the other side of the pass, you can either hike or pick up a ride to Lucmabamba. If available, the Lucmabamba Coffee Experience is a great place to camp. See what coffee looks like growing on the plant, take your hand at shelling some beans, and enjoy fresh roasted coffee. Say goodbye to Lucmabamba and follow the trail towards Llactapata. After a couple of hours of hiking you will arrive at the ruins. 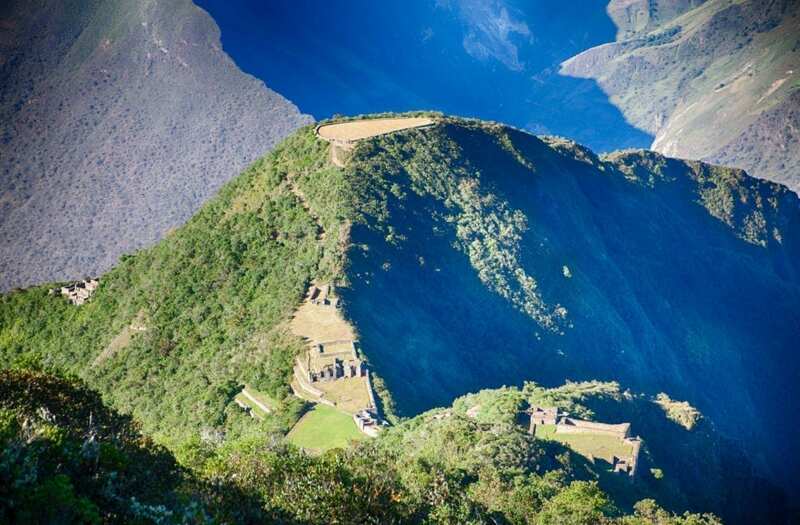 Here is where you can catch your first views of Machu Picchu across the valley. 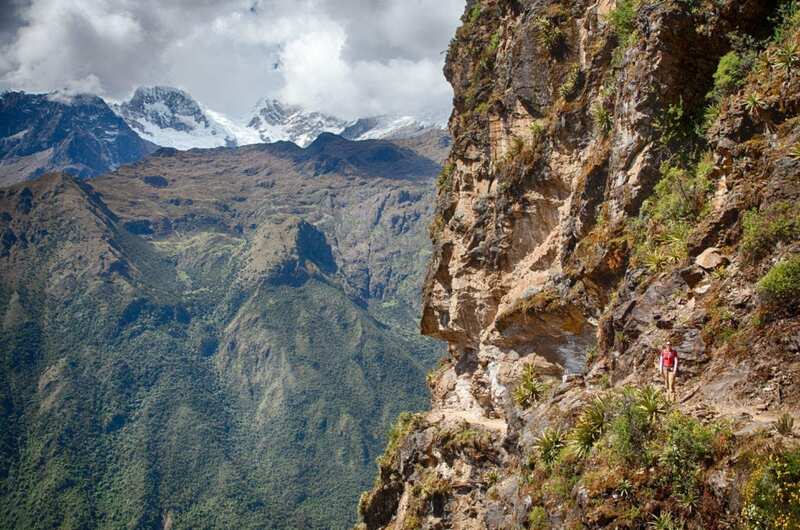 Llactapata is considered an important stop on the Inca Trail and has special significance on summer equinox. As you explore the ruins you will see a door with a channel leading up to it. Rumor has it, on summer equinox, when the sun hits the sun dial at Machu Picchu the line can then be traced perfectly all the way to the channel, and through the door, at Llactapata. After exploring the ruins and capturing your first photos of Machu Picchu, follow the trail down to the hydroelectric station (Central Hidroelectrica Machu Picchu). At this point, you can either hike the 2 hours or hop the PeruRail to Aguas Calientes. The train is air conditioned and a nice break for tired feet. After 7 days on the trail Aguas Calientes feels like a big city with hot showers, lots of people, plenty of shops to peruse, and multiple restaurants to excite your taste buds. Get a good nights sleep and get ready for Machu Picchu on day 8. Start Day 8 early. Whether you choose to hike up or take one of the many buses an early start is recommended. This will get you through the entrance gate and walking among the ruins before the big crowds show up. Meander your way through farming terraces and buildings, take in views of the surrounding wilderness, look across the valley to see if you can spot Llactapata, and soak in the history of the area. 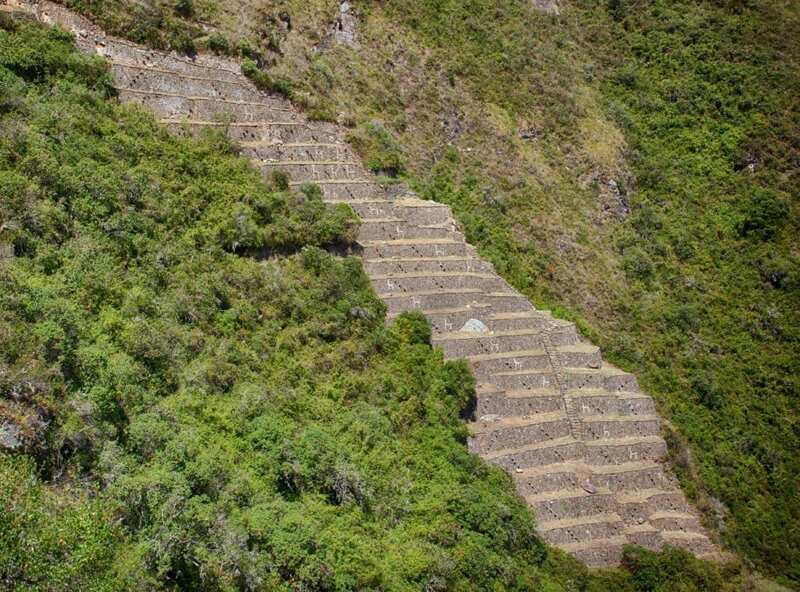 A nice add on is to hike up Huayana Picchu (the short mountain that towers over Machu Picchu). The hike is steep and tough, but being able to see the entire Machu Picchu complex at once is well worth the effort. 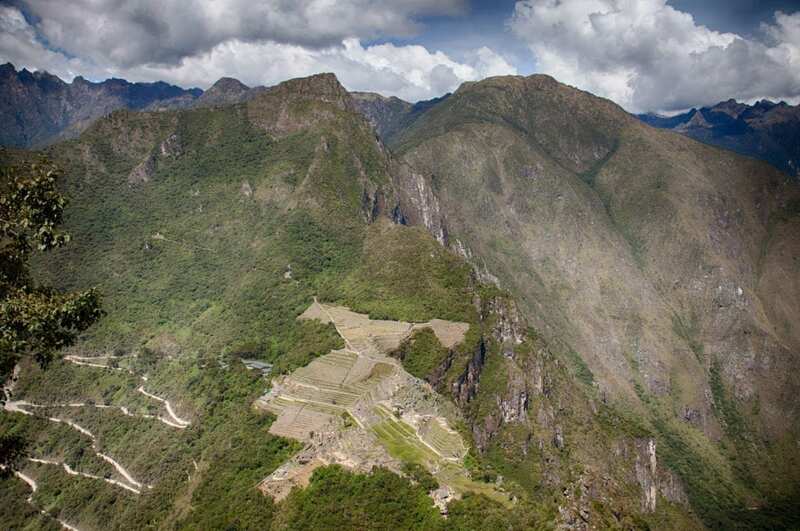 Note, tickets to enter Huayna Picchu are limited to 400 per day and are broken up between 2 entrance times. When you are ready, head back to Aguas Calientes and hop on the evening train (or bus) back to Cusco. If hiking to Machu Picchu is an item on your bucket list consider hiking the Choquequirao trail. It may be a bit longer and more strenuous than others, but the landscape, the views, and the journey will be something that you will never forget. El gobernador regional de Apurímac, Wilber Venegas, informó este jueves, en el marco del 7mo GORE Ejecutivo, sobre la posible firma de un proyecto junto al gobernador de Cusco, Edwin Licona, para permitir la construcción de sistema teleférico en Choquequirao, complejo arqueológico ubicado en Cusco, cerca del limite con Apurímac. “De acuerdo al proyecto firmado por el Gobierno Regional de Cusco y Apurímac, y alcaldes de las jurisdicciones, este permitiría crear un nuevo corredor turístico para construir una telecabina de Choquequirao hasta Yanama, con un ingreso nuevo a Machupicchu, y de Choquequirao a San Ignacio para también permitir la salida o ingreso de turistas desde abancay”, indicó la autoridad regional, en declaraciones al diario El Comercio.